Jerad Eickhoff gets the ball tonight as the Phillies continue their season-opening series with the Reds in Cincinnati. Rain, at times heavy with thunder, is forecast through the evening at Great American Ballpark. 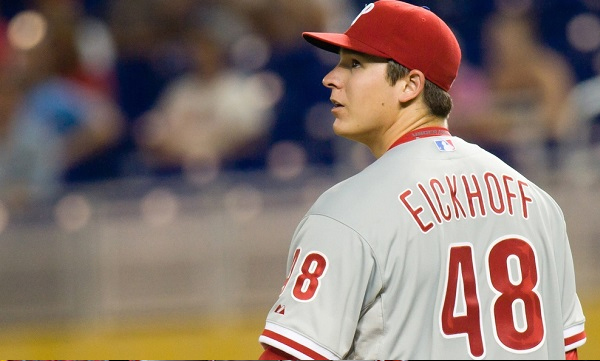 Eickhoff made 33 starts last season and finished the year with a 3.65 ERA to go with a respectable 1.16 WHIP. Similar results are expected from the 26-year-old righty this year as the younger arms in the Phillies' rotation continue to mature. He's never pitched at Great American Ballpark, nor has he ever faced any of the hitters in tonight's Reds' lineup. The Reds counter Eickhoff with lefty Brandon Finnegan. The 23-year-old struggled at times last season with right-handed batters to the tune of a 4.67 ERA. He did, however, pitch extremely well after the All-Star break with a 2.93 ERA over his final 13 starts. Vegas again has the Reds listed as a slight favorite with the over/under at 9. The Reds claimed outfielder Tyler Goeddel off waivers from the Phillies on Wednesday afternoon. The Phillies designated the 24-year-old for assignment last week to clear a spot on the 40-man roster for Brock Stassi. Goeddel hit .192 over 92 games with the Phillies last season.